MEXICO CITY -- A blast that collapsed the lower floors of a building in the headquarters of Mexico's state-owned oil company, crushing at least 33 people beneath tons of rubble and injuring 121, is being looked at as an accident although all lines of investigation remain open, the head of Petroleos Mexicanos said Friday. As hundreds of emergency workers dug through the rubble, the company's worst disaster in a decade was fueling debate about the state of Pemex, a vital source of government revenue that is suffering from decades of underinvestment and has been hit by a recent series of accidents that have tarnished its otherwise improving safety record.
" It seems like, from what one can observe, from what the experts are seeing, that it was an accident"," Pemex Director-General Emilio Lozoya told the Televisa network. "However no line of investigation will be discounted." Mexican President Enrique Pena Nieto has pledged to open the oil behemoth to more private and foreign investment, setting off warnings among leftists about the privatization of an enterprise seen as one of the pillars of the Mexican state. Pena Nieto has provided few details of the reform he will propose but denies any plan to privatize Pemex. In a debate on MVS Radio about Pemex Friday morning, Juan Bueno Torio, a congressman from the conservative National Action Party, said Pemex should be granted more budgetary independence as part of the reform, allowing it to better address infrastructure problems that he said have been neglected under government control. "There are always maintenance problems," he said. Manuel Bartlett, a senator from the leftist Workers' Party, shot back that Pena Nieto "has been touring the world inviting investors and foreigners to invest in Pemex." "Privatizing Pemex is taking away the control of the Mexican state and transferring it to private hands," he said. Less than 24 hours after the accident at Pemex headquarters, early signs pointed to a problem in an area with electrical and air conditioning equipment, according to a government official who was not authorized to speak by name. Pemex said in a tweet in the first minutes after the accident it had evacuated the building because of a problem with the electrical system. 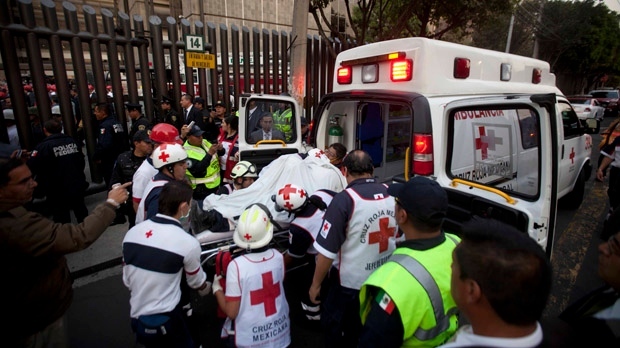 A Pemex spokesman said the floors hit by the explosion housed administrative offices. Pemex and Interior Secretary Miguel Angel Osorio Chong said on their Twitter accounts Friday afternoon that the death toll had risen to 33. Mexico City Mayor Miguel Angel Mancera declared three days of mourning, with flags at half-staff and black bunting hung on public buildings. Lozoya said the priority remains rescue and recovery, plus attending the families of those who died and the injured, which include 52 people who remain hospitalized. Attorney General Jesus Murillo said Friday afternoon that rescue crews have searched most of the area damaged by the blast but that survivors or more victims could still be found in the most unstable parts, which have not yet been fully checked. The explosion was the worst in more than a decade for Pemex. Last September, an enormous blast killed 30 workers at a pipeline facility in northern Mexico. Murillo said experts have "not found any indication of fire." That disaster was a major setback to a safety record that had been improving following a series of incidents in the 1980s and 1990s, according to company figures. The number of accidents per million hours worked dropped by more than half, from 1.06 in 2005 to 0.42 in 2010. That is in line with the international average of about 0.43 per million, according to the U.K.-based International Association of Oil and Gas Producers, which does not independently verify company numbers. But Pemex acknowledged in a report that starting in late 2011, a series of smaller blasts and fires, mainly at refineries and petrochemical plants, had "seriously impacted" its safety rate. It said the rate of injuries per million hours had risen to 0.54. As part of the federal government, Pemex is entirely responsible for inspecting its own buildings. A Pemex spokesman said the company could not immediately provide information about the affected building's safety record because of the workload generated by the response to the explosion. Mexico City-based oil analyst David Shields said he was pessimistic that any one particular accident would have a real impact on the broader push for reform. "What they really do is spark a certain amount of indignation, most of the time they don't result in changes," he said. Before the pipeline blast in Reynosa, Pemex's last big accident was in 2007, when a sudden storm hit an offshore oil rig, killing 22 workers. Thursday's explosion occurred at about 3:45 p.m., just as the administrative shift was about to end. It hit the basement and three floors, where as many as 250 people work, Lozoya said. The floors collapsed in the 14-story administrative building at the headquarters office complex, which was built starting in the late 1970s. Some 10,000 people work there daily. Lozoya said about 1,700 work in the building affected. Gabriela Espinoza, 50, a Pemex secretary for 29 years, was on the second floor of the tower when she said she heard two loud explosions and a third smaller one. "There was a very loud roar. It was very ugly," she said. Lozoya said Pemex operations continue uninterrupted despite the blast and that the company is producing 2.57 million barrels of oil per day. Pemex, created as a state-owned company in 1938, has nearly 150,000 employees, according to its website, with $111 billion in sales. Pena Nieto, who took office in December, has made Pemex reform the centre of his platform, with a plan to pump new investment into a company whose profits feed much of Mexico's federal budget, but which has fallen behind other oil companies in production, technology and exploration.